Miele Australia has introduced two new CombiSet sets featuring a new downdraught extractor that sits between two CombiSet modules at benchtop level to enable continuous extraction of steam and cooking vapours. 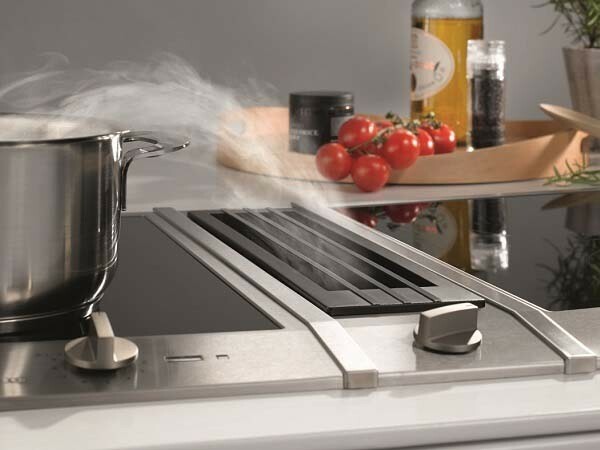 The central placement of the downdraught extractor ensures steam from the cooking pans is extracted at the height at which it rises, and not at a distance above; the technical componentry of the extractor is concealed below in the benchtop. The extractor offers the flexibility to be installed wherever convenient in the kitchen layout including against a wall or in a cooking island. Miele CombiSet modules can be placed on either side of the downdraught extractor unit to suit different cooking preferences. Individual modules come complete with an all-round stainless steel frame while the solid metal knobs are both stylish and easy to handle. Miele CombiSet extractor sets are available in a choice of two CombiSet configurations: Miele CSDA 1010 includes two induction units, each with two rings including a casserole zone; and Miele CSDA 1020 comprises of an induction cooktop on one side and a TepanYaki stainless steel contact grill on the other. Key features of the CombiSet extractor include a powerful fan with an energy-efficient Eco motor offering three power settings and a booster stage; dishwasher-proof 10-ply metal grease filter pre-fitted to the extractor unit; optional recirculation conversion kit available for situations where the CombiSet extractor cannot be ducted to open atmosphere; and compact componentry allowing sufficient space in the base unit for drawers. The additional conversion kit includes a new type of long-life charcoal filter, which can simply be regenerated in the oven up to six times, before they will eventually require replacement. The fan unit installation for the CombiSet extractor offers sufficient flexibility to allow the vent ducting to lead off in the most suitable direction. In recirculation mode, filtered air re-enters the kitchen through a grille in the kitchen plinth; this grille can even be accommodated in a plinth with a height of only 10cm. The Miele CSDA 1010 and CSDA 1020 three-in-one combinations are available from Miele Experience Centres and Miele Authorised Retailers around Australia.